By My Standards (22-1) took advantage of a perfect inside trip under Gabriel Saez to win the 2019 Louisiana Derby-G2 at Fair Grounds on Saturday, March 23, topping a $331.80 exacta over Predictem.com wild card selection Spinoff (4-1), but that probably wasn’t the biggest story of the race. Heavy favourite War of Will took a scary-looking bad step a few strides out of the gate and finished ninth. We have to give him a pass on his performance based on his early mishap. We’re just hoping he’s okay and that he comes back to fight like his old self on another day. The race set up somewhat as predicted when Leminscate opened a clear lead early over Sueno and got the first quarter in 23.63. Sueno moved up outside to force the pace through a half-mile in 47.68 and six furlongs in 1:11.54 while Predictem.com wild card Spinoff tracked the pacesetters from a few lengths back on the outside. War of Will settled between horses, By My Standards found a good position inside, and third choice Country House stalked from back and outside. The real running started about midway through the final turn. Sueno turned up the heat on Leminscate and turning for home it was anybody’s race. Leminscate gave to Sueno in early stretch just as Spinoff, Mr. Money and Country House were challenging from the outside. By My Standards waited briefly for room in early stretch before finding a hole between horses and surging inside to take over from a tiring Sueno, just as Spinoff took a short lead on the outside. By My Standards took a short lead from Spinoff in midstretch and gradually drew out to best that one by three-quarters of a length. It was five lengths back to Sueno in third, who was three-quarters of a length in front of Country House in fourth. Mr. Money, who had been stalking from mid pack on the outside, made a nice move between horses to challenge into the stretch, but was all done by mid stretch and finished 1 ½-lengths behind the disappointing Country House, who had also made a menacing wide move on the turn before hanging in the stretch. Roiland, who finally figured out how to get out of the gate, had a good trip stalking inside and made his run behind the pack into the stretch, giving his best to finish sixth. Bankit broke slightly off balance, dropped back to last early, made his move widest on the final turn and couldn’t gain in the drive, finishing seventh. Eighth-place finisher Hog Creek Hustle was bumped mildly early and stalked off the rail while appearing to be restrained on early backstretch. He advanced between horses and behind the pack on the final turn and was outrun in the drive. Limonite was taken back early, stalked off the rail, made a wide move on the final turn and was also outrun in the drive, finishing tenth, just ahead of pacesetter Leminscate, who faded to eleventh and last after giving way in early stretch. Favourite War of Will got a decent trip between horses behind the pacesetters and was in striking position turning for home but was definitely not the same horse we saw winning the LeComte-G3 and Risen Star Stakes-G2 in his previous races, finishing an even ninth. Initially we thought he might not have liked being between horses, but a review of the replay clearly shows that he bobbled a few strides out of the gate and then took a terrible step with his right hind foot after that. 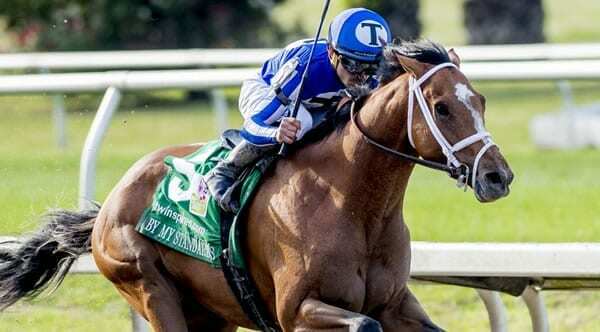 War of Will now has to be moved off our 2019 Kentucky Contenders Top 10 list until we see how he recovers. In the meantime, we’re trying to figure out if the winner and runner-up in the Louisiana Derby are for real. Trained by Bret Calhoun, By My Standards paid $47.00 $16.60 $9.40 across the board and completed the 1 1/8-miles in 1:49.53, which was good for a 97 Beyer Speed Figure. The bay 3-year-old colt is by two-time Breeders’ Cup Mile winner Goldencents out of multiple stakes-winning mare A Jealous Woman by Muqtarib. He was a $150,000 purchase at the 2018 Ocala Breeders’ Sales Spring Sale of 2-Year-Olds in Training. Only two horses have ever won both the Louisiana Derby and the Kentucky Derby, Grindstone in 1996 and Black Gold in 1924. Additionally, we’re wondering about the strength of the field in the 2019 Louisiana Derby. Although we thought War of Will and Country House were legitimate horses, runner-up Spinoff was making just his second start off the layoff and had some major gaps in his form. War of Will hurt himself, Country House may have bounced and Sueno looks like he is about as good as he is going to get. When Black Gold won the Kentucky Derby in 1924 it was the 50th running of the race and it was celebrated as the Golden Jubilee Derby. It also marked the first time “My Old Kentucky Home” was played at the Derby and a “Golden Cup” was presented to the winner. By My Standards is by Goldencents. Black Gold, Golden Jubilee Derby, Golden Cup, Goldencents… Is that enough yellow for you? We’ve seen people bet on horses for dumber reasons.